This is the book bag I made, it was pretty simple. 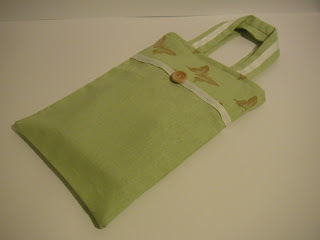 I used a plain sage green linen fabric to make a small shopper style bag, I stamped two pieces of fabric using a butterfly stamp and added them to the top section of the bag. I added some cream grosgrain ribbon to the area where the two fabrics joined and I also added some to the handles. I finished the bag off with a wooden button.